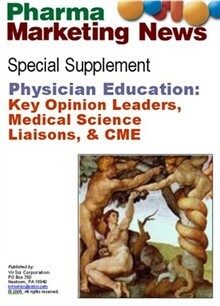 This Special Supplement to Pharma Marketing News is critical reading for pharmaceutical companies and physician education service providers wishing to understand the new roles of key opinion leader physicians (KOLs) and medical science liaisons (MSLs) in the physician education process. While funding for CME may have shifted out of the control of the marketing departments at most pharma companies, there is still a desire for marketing to reach out to physicians with educational promotional programs that are more within their control. MedPoint Communications, a marketing and educational services company headquartered in Evanston, IL, manages multi-channel, “within label medical education” programs for its pharmaceutical clients. This article is an edited transcript of the May 2006, Pharma Marketing Roundtable discussion, which was devoted to exploring issues surrounding the new roles of medical science liaisons (MSLs) and key opinion leader physicians (KOLs) in physician education and product marketing. CME Provider/Pharmaceutical Partnerships – Are They Possible Without Conflict of Interest? This article answers the following questions regarding pharma support of academic CME providers: What strategies should a pharmaceutical company follow to ensure a successful partnership with an academic CME provider? What’s an appropriate measure for outcomes (ROI)? What % of income from academic CME programs comes from pharma support? At the end of September 2004, the seven member organizations of the Accreditation Council for Continuing Medical Education (ACCME®) unanimously approved the 2004 Updated ACCME Standards for Commercial Support: Standards to Ensure the Independence of CME. When these rules go into effect in July 2005, it is unclear how they will affect industry participation and support of CME or how these rules change the status quo for Providers soliciting CME support from industry. A panel of experts at the recent CBI 5th Annual Continuing Medical Education conference in Princeton, NJ tackled these issues. The discussion is summarized in this article. This article describes the changes occurring viz-a-viz major medical conferences and the impact this will have on the pharmaceutical industry, medical societies, healthcare professionals, and patients. Access to physicians is becoming more and more of a problem. Doctors need immense amounts of medical information, but their patient loads limit their ability to see pharma sales reps or attend conferences or other educational activities away from their offices at such venues as local restaurants and hotels. And it is impractical to bring KOLs and experts into the physician’s office. One way to bring these resources to physicians is through Web conferencing. This report describes a turnkey system that is being used effectively to host 6,000 live online events per year, attended by some 300,000 physicians around the world. The FDA recently finalized its Good Reprint Practices for the Distribution of Medical Journal Articles. This article outlines the major provisions of the guidance and helps you learn how to make it work for your company. This article summarizes some of issues raised by FDA’s proposal that pundits and experts are debating on the Internet, in the press and in official comments submitted to the FDA. 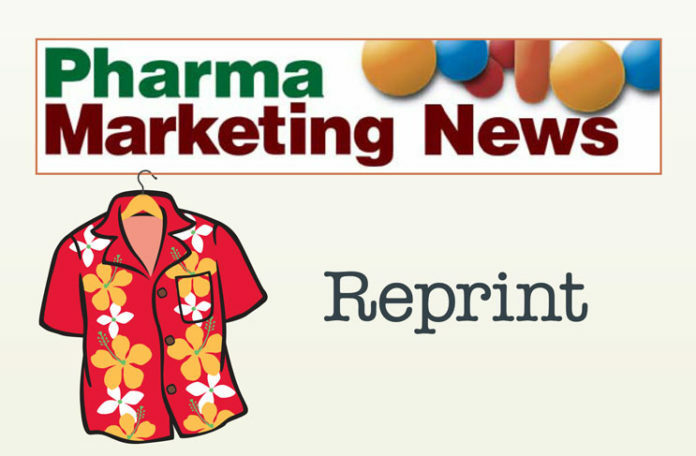 It also presents preliminary results of an online survey sponsored by Pharma Marketing News. Pharma Marketing News hosted an online survey and a Pharma Marketing Expert Roundtable discussion on the topic of pharma gifts to physicians. This article summarizes the findings of that survey and includes comments and insights from survey respondents and Roundtable members. This scathing review of the book ‘Hard Sell: The Evolution of a Viagra Salesman,’ which is a tell-a-lot-but-not-all about pharmaceutical sales, explores the connection between flagging sales force effectiveness and the generation gap between Boomers and Gen-Xers. ‘Dude,’ read it! Is It Time to End Industry Sponsored CME? Preliminary results from a survey of Pharma Marketing News readers about their views regarding industry sponsorship of accredited CME, including views on value, bias, ACCME firewalls, and alternative means of CME support. How Can Bias in Commercially-Sponsored CME Be Limited? Managing a winning team of Medical Liaisons, MLs, from afar, not only demands proper selection of highly driven, self-motivated and scientifically-fluent professionals, but also requires a manager’s recognition and vision of ‘top-down-bottom-up’ leadership style: consistent, rapid long distance communication, a team-shared vision of goals and responsibilities, and a working foundation of trust for overall success and ML job satisfaction. This article reviews a presentation made by Mario Sylvestri, Pharm.D, PhD, Senior Director Medical Informatics and Communications, Amylin Pharmaceuticals. Medical Science Liaisons (MSLs) have assumed a pivotal role interfacing between pharmaceutical and biotechnology companies and the opinion and thought leaders (OTLs) who influence how medicine is routinely practiced. This article highlights how MSLs can maximize their unique position to help improve medical care while they enhance their companies’ bottom lines. In addition to her clinical and professional role as an experienced and successful MSL for Sepracor in the Indianapolis, IN area, Erin Albert, R.Ph, MBA, has spent a considerable amount of time researching and gathering psychometric data about her peers’ job satisfaction in their current MSL roles. This article reviews a presentation by Bob Reina, MS, MBA, Vice President of the Veritas Institute for Medical Education, and Sharon Schneider, PsyD, MBA, Program Director, Medical Education, Ortho-McNeil Pharmaceuticals Inc., entitled “Field Liaisons Team Effectiveness, The Role of the MSL in the Medical Education Setting.”. Medical Science Liaisons (MSLs) today face unprecedented challenges in developing and managing strong clinically-focused relationships with key opinion leaders (KOLs). Many presenters at a recent CBI Annual Forum on Field-Based Dissemination of Scientific Information held in Philadelphia spoke candidly and openly about these challenges and how they are being met by the industry. This article summarizes several presentations made at this meeting. This commentary takes a look at some “murky” (ie, non-transparent) physician marketing practices and presents opinions from several Pharma Marketing Blog polls and commentators. When is a Free Lunch More Than Just Lunch? This article reviews the physician payment lists published by Lilly, Merck, and GSK. The analysis gives us more insight into the fees paid by various companies, how the money was distributed by state and region in the US, and what types of activities (eg, speaker fees vs. consulting fees) physicians were paid to perform. Pharma Marketing News surveyed readers to determine if medical journal articles sponsored and ghostwritten by drug companies are a legitimate part of marketing to physicians and to get opinions on various other issues raised in the press about ghostwriting. This article discusses marketing to physicians in light of the industry self-regulatory Code on Interactions with Healthcare Professionals as well as the final OIG Compliance Program Guidance for Pharmaceutical Manufacturers. To better understand the impact on the pharmaceutical industry of PhRMA’s Code on Interactions with Healthcare Professionals, Pharma Marketing News surveyed readers between July 10, 2008 and August 7, 2008, and collected comments from pharma-focused blogs and bulletin boards. This article is a summary of the PMN survey results and opinions of experts, bloggers, and anonymous commentators. But Are Unwilling to Pay Their Own Way! Talk about having your cake and eating it too! Commercial funding of continuing medical education (CME) and the potential for bias appear to concern many physicians, yet only a TINY MINORITY (7%) are willing to pay registration fees to eliminate or offset commercial funding sources, according to a report in the May 9, 2011, issue of Archives of Internal Medicine, one of the JAMA/Archives journals. This article reviews the physician meeting logistics and planning capabilities of Alliance Communications, which has worked with pharma companies and key opinion leaders since 1987. This article reviews the strategic implications of the Sunshine Act and also presents highlights of the draft regulations rule released by the Centers for Medicare and Medicaid Services on December 15, 2011. Massachusetts and several other states have put either banned all gifts to physicians by pharmaceutical companies, placed limits on gifts, or or considering doing so. At least ‘sunshine’ acts have been proposed in Congress as well. This article reviews some aspects of these ‘sunshine’ laws and focuses on a recent CALPIRG analysis of drug company gifts to physicians. A point-counterpoint assessment of ACCME’s draft Standards for Commercial Support (SCS) and its effect on the partnership between accredited CME providers and pharmaceutical supporters. Three pharmaceutical company CEOs discuss their path from science to leadership and the role of medical science liaisons. Classic Sales Rep: An Endangered Species? Practically every pharmaceutical company has one or more apps. The ones I am interested in are apps designed to help doctors in their diagnosis of patients. Big among these are the “calculator” apps, which calculate things such as glomerular filtration rate (GFR), Medication Adherence Rating Scale (MARS), Delayed Graft Function (DGF) Risk, creatinine clearance, dosing algorithms, Body Mass Index (BMI), and, my favorite, Psoriasis Area and Severity Index (PASI). At least one of these apps has been recalled due to a software bug. But recalling does not mean it’s not still being used by physicians. Continuing Medical Education (CME) in Europe has undergone some major shifts in recent years. These have varied across Europe: from national changes in which systems have moved from being voluntary to mandatory, to the establishment of more formal systems to guide physicians on how to keep up-to-date with latest clinical practice. Pharmaceutical companies are continually working to establish and maintain relationships with thought leaders — influential physicians who play an important role in communicating a new therapy’s benefits for other physicians. Thought Leaders — also known as Key Opinion Leaders, or KOLs — help pharmaceutical companies identify unmet medical needs, shape clinical studies, launch products and understand critical lifecycle issues. However, across the medical device and pharmaceutical industries, thought leader management programs have not been as effective as internal management would like, particularly in the age of the Internet, when the dissemination of information should be easier than ever, according to John Estafanous, President of Bethesda, Maryland-based Estco Medical. Members and guests of the Pharma Marketing Roundtable met via conference call to discuss trends in commercial support of CME. This article summarizes that discussion. Will commercial (for-profit) CME providers and producers increasingly give way to academic center networks? Are the days of the large CME companies numbered? Which technological and media approaches for CME delivery are gaining favor…and which are losing ground? What role should CME play in strengthening the communicative skills of MDs in their interactions with patients? Why aren’t we seeing more of this with the advent (peaks and valleys) of DTC? A joint presentation by John F. Kamp, Ph.D., J.D., Partner, Wiley, Rein & Fielding and Linda Casebeer, Ph.D., Associate Professor, CME at the University of Alabama School of Medicine, offered a point-counterpoint assessment of ACCME’s draft Standards for Commercial Support (SCS) and its effect on the partnership between accredited CME providers and pharmaceutical supporters. This article by contributing author Neil Gray, examines why the industrys current use of tactical value measures for MSLs might ultimately prove limiting by positioning MSLs inappropriately and inhibiting their broader involvement in organizational and stakeholder problem-solving. The author examines how tomorrow’s MSL might be employed by Pharma and discusses the strategic movement of MSLs into the competitive intelligence space, teaching roles, strategic input to and evaluation of portfolio development, and investor relations. Recent headlines pulled from traditional media as well as from the blogo-sphere paint a bleak picture of the future of commercial support for continuing medical education (CME). Is the pharmaceutical industry getting out of the business of supporting CME? This article summaries Congressional testimony, ACCME data, and results of a reader survey on this topic. When Is Commercial Support Appropriate for CME Activities? On April 1, 2004, the Board of Directors of the Accreditation Council for Continuing Medical Education (ACCME), by unanimous vote, adopted the updated ACCME Standards for Commercial Support of Continuing Medical Education. This article summarizes when it is and is not appropriate for pharmaceutical companies to support independent CME programs. Congress continues to examine pharma industry support of CME and ACCME has issued some new guidance for accredited CME providers. This article examines the current state of industry support for CME and what reforms may be coming down the pike.